A simple plan for low rain lawn care, cutting grass in dry weather, top tips for lawns in summer, keeping grass green in drought. Deja vu. June 2017 saw dry weather and brown lawns. Even after the longest wettest winter for a while, in May 2018 some grass is already starting to turn brown. Here are some pointers for low rain lawn care. Lawns that have been managed carefully will be thriving still. A plan that increases the strength of the grass is paying dividends now, with green swathes still dominating as a result. But it’s not too late to adopt a plan that will save time, money and will keep your grass greener and healthier. If you haven’t planned for it, what can be done now? Here’s a simple guide. When cutting, use a mulching deck, or leave the grass clippings on the lawn. A mulching deck cuts the clipping smaller, and returns them to the soil. This allows them to break down and feed the lawn. 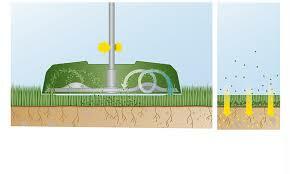 And a low rain lawn care plan to keep it greener starts very simply too. Keep the grass longer. Think of “making it even” rather than cutting the lawn. And if moss is present, raise the cutting height to leave it 20mm clear. Cutting too short is the main reason for moss and weed dominance in most lawns. Make sure your mower blades are kept sharp. Cut in small slices. If the lawn is longer, rather than try to cut it down in one pass, take two or even three passes, reducing the height slowly. These smaller cuttings will break down more easily, and feed and replenish the grass, rather than rot. Apply the rule of only cutting one third of the grass blade. Mulching, or leaving fine clippings on the lawn, saves time in removing them to the compost or bin, and also returns valuable nitrogen to the soil. This could reduce the feeding requirement by 25 per cent. Given that most lawns don’t get fed at all, its a huge improvement. The evidence is clear. To do less work when the weather is dry and hot, cut the lawn higher, leave the clippings, which will help keep your lawn green. 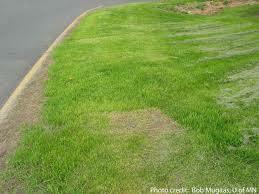 Scalping weakens the grass, leaving t vulnerable to weeds and heat. Cut the grass long! How to stop lily beetle, red lily beetle, what’s eating my lillies, kill lily beetle, eradicate lily beetle, stopping lily beetle, red lily beetle,lily beetle garlic spray, lily beetle UK. At this time of the season, whenever that is in the year, two particular subjects dominate my garden. One is day lillies and the need for constant dead heading. The other is lily beetle. The two jobs can be connected, but don’t offer the same enjoyment. Dead heading the Hemerocallis rewards you with more flowers. It’s also a chance to be in the border again. In the morning this is with a good cup of tea in hand, but in the evening it may well be a crisp white or rose. Whilst surveying the decaying day lily blooms I keep an eye out for the little red monsters that can shred your lillies in a moment. 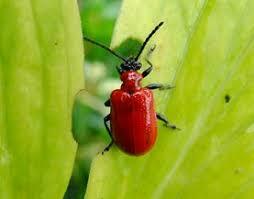 Red lily beetle don’t touch day lillies, just the true lily family, Lilium, Cardiocrinum and Fritillaria. Red lily beetle are black underneath, so when they fall to the ground are very hard to see. Since discovering that these apparently delicate plants were quite hardy I’ve planted many more, and with them comes the invading red bugs. the result is worth the effort though. What happens if you don’t stop red lily beetle? These pests are attracted to the smell of the lillies. When they find them they quickly reproduce and leave hundreds of offspring that will eat the leaves and stem. This may actually stop the plant flowing. So keeping them off is justified. They have to be worth protecting from red lily beetle! I employ two strategies in stopping lily beetle. One is to stop them finding the plant to start with, and second to kill them if they do find it. To mask the scent of the plant I use blended garlic filtered into a spray bottle. I mix in some washing up liquid to make it foam and stick to the leaves for longer. You must continue to apply it fairly regularly though. To make it use a couple of cloves crushed or finely chopped, leave to diffuse in boiling water for five minutes, then filter ( the pulp will block the sprayer) into a spray bottle. Add washing up liquid, then top up with water. Keep te pulp in a sealed jar to use next time, you’ll get four or five uses from one pulp. And when I spot the red devils I use two hands to pick them off. One hand is beneath them, as they have a habit of just letting go of the leaf and falling to the ground where they’re hard to spot. The other can pick them off. Dispose of them with a foot on a hard surface. The garlic spray needs to get to as much of the leaf surface as possible, including underneath. Here you may see the nasty clutches of eggs laid in excrement. Remove these as well to prevent rapid re-infection. 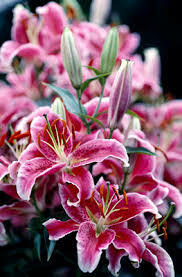 I am always looking for other ways to enhance my protection of the lily plants with something sprayable and sticky, and equally pungent so the bugs can’t find the host. How to stop lily beetle, red lily beetle, what’s eating my lillies, kill lily beetle, eradicate lily beetle, stopping lily beetle, red lily beetle,lily beetle garlic spray, lily beetle UK. Local gardener in Bourne End, Flackwell Heath gardener, Taplow gardener.